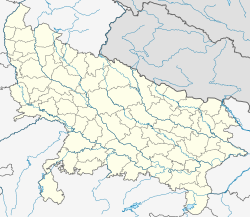 Dibai (also spelt as Debai) is a town and a municipal board in Bulandshahr district. It is a tehsil town and also a constituency of legislative assembly in the state of Uttar Pradesh, India. Dibai had a population of 39902 according to census 2011. Dibai is located at 28°13′N 78°15′E﻿ / ﻿28.22°N 78.25°E﻿ / 28.22; 78.25. It has an average elevation of 184 metres (603 feet). Dibai is known for Zamindar Families. Kuber Inter College founded in 1885 by Thakur Kuber Nath ji and Digamber PG College founded by Thakur Digamber Singh ji are two main colleges in Dibai. Well known educationist and environmentalist Prof. Ramesh Chandra Singh was a product of these colleges. Institution of Engineers award Prof. R.C. Singh Gold medal for Environmental Engineering every year. These colleges are now operated by Kuber high school association operated by Dr. Suresh Chandra Singh and Subhash Chandra Singhal, Advocate and other trustees. These colleges are giving education to thousands of students. There are nine renowned Thakur families which starts Charitable Educational Institution known as Anglo Indian Vernacular Sanskrit Pathshala in 1885 which later on expands and convert into two colleges Digamber PG College and Kuber Inter College(KIC). Dibai also have various famous educational institutions such as Rampyari Kanya Pathshala which was founded in the year 1937 by a reputated business family of Dhurimal Bazaz and Rajni Public School, a CBSE recognised Co educational school. Now Dibai people chasing ahead there are so many people who's become local entrepreneur like- Sachin Raj is a web developer and also a nutritionist about high protein. and writer Intizar Hussain also born in Dibai. As of 2001[update] India census, Dibai had a population of 34,853. Males constitute 53% of the population and females 47%. Dibai has an average literacy rate of 50%, lower than the national average of 59.5%: male literacy is 58% and, female literacy is 41%. In Dibai, 16% of the population is under 6 years of age. Intizar Hussain, eminent Urdu fiction writer of Karachi, Pakistan was from Dibai. Dibai is also the former constituency of BJP leader Kalyan Singh, former chief minister of Uttar Pradesh. Dibai also have many local areas like Bara Bazar, Chhota Bazar, Mahadev Choraha,meena bazar, jogi pada, Shri J C Bhardwaj was an eminent and noted person from Jogi Panda area. He contributed in grooming the generation of Dibai by teaching them scientific education, physics and making them spiritually advanced. ^ Imtiaz, Saba. "Karachi Literature Festival: 'Book' your seat for this ride". The Express Tribune. Pakistan. Retrieved 11 July 2012. This Bulandshahr district location article is a stub. You can help Wikipedia by expanding it.